In recent times, flying with your ESA have become common sights on airplanes. Unlike service animals such as guide dogs (which are specifically trained to provide some form of special service), Emotional Support Animals take care of their owners’ psychological, psychiatric and emotional needs. 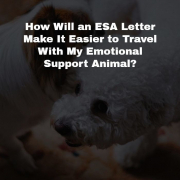 Although you are allowed to fly with your ESA, all airlines have policies which must be strictly followed before your animal can come on board: however, the rules on flying with support animals can be confusing and complicated. You won’t be allowed to board the airplane if you show up at an airline gate and declare your pet an ESA. In case if you need your ESA letter ASAP we provide patients with online ESA letters, call us to find out how to apply for ESA online. We will be able to provide you with a digital ESA letter in 20 minutes. Due to the marked increase in the number of individuals wanting to travel with their emotional support pets, airlines have had to create detailed policies on what kinds of animals are allowed in the cabin area. Reports released by Delta show that they carry nearly 700 support animals daily. The report also states that there has been an 84% increase in the number of animal-related incidents on their planes. You must ensure that you provide official documentation in the form of a properly formatted ESA letter which is prepared and signed by a licensed mental health professional such as a therapist, psychiatrist, or psychologist. Before going to the airport to catch your flight, you should ensure that you are familiar with the airline’s policies on flying with emotional support animals. 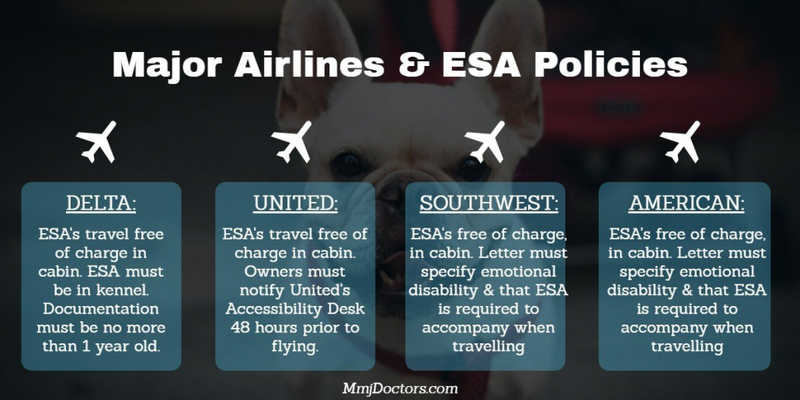 Let’s take a look at some of the major airline’s policies on flying with ESAs. Delta requires ESA owners to download and fill out certain forms before they can fly with their animals. The only animals allowed in the cabin are those that will not exceed the footprint of your seat. Delta also reserves the right not to fly with animals that bark excessively, growls, relieves themselves in waiting areas or on board, jumps on passengers or eats off back tray tables. United recently implemented more robust procedures for flying with your pet. 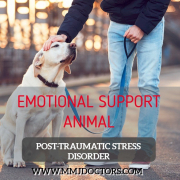 You must come along with documentation from your vet and licensed mental health professional as well as a confirmation that your animal will behave properly in public. When it comes to size, United requires that your animal must fit around your seat and not protrude into the aisle or any other area. Passengers may choose to use an in-cabin kennel for smaller animals. American Airlines require you to send in a doctor’s letter in advance (at least two days) if you want to fly with your emotional support animalor the animal will be created and travel in the cargo area. The letter must be issued within the year of travel, be in the proper format and contain all the relevant details. Also, they require that your animal must be able to fit under the seat, on your lap, or stay at your feet, without blocking the aisle. ESAs are not allowed for individuals flying to Auckland, New Zealand. Passengers who want to fly with their ESAs must present relevant documentation that states their emotional and psychological disability and supports their need for an ESA. This is usually covered by a properly formatted ESA letter. JetBlue also requires all ESAs to either sit on the passenger’s lap or the floor. They are not allowed on seats. Before embarking on a flight with your ESA, Virgin requires you to present appropriate documentation in the form of an ESA letter. The letter must be prepared by a certified mental health professional and establish the status of your disability, along with other pertinent details. When traveling to Hawaii, Virgin also requires a health certificate for your animal dated no later than 30 days from the date of departure. Southwest allows passengers to fly with support animals as long as they don’t block evacuation routes; however, exotic and unusual animals are not allowed in the cabin. This includes sugar gliders, rabbits, hedgehogs, reptiles, spiders, insects, ferrets, and rodents. Passengers must present authentic documentation from a licensed mental health professional stating their disability and other relevant details. They allow ESAs on all flights except those going to Jamaica. 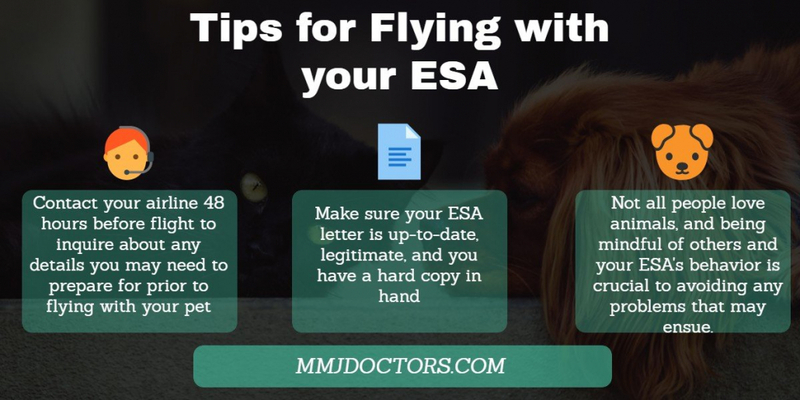 Generally, all airlines require you to present an ESA letter (issued in the year of travel) before boarding the cabin with your animal. You must also ensure that your ESA is calm and well-behaved in public. It is a good idea to train your animal before embarking on flights with it. 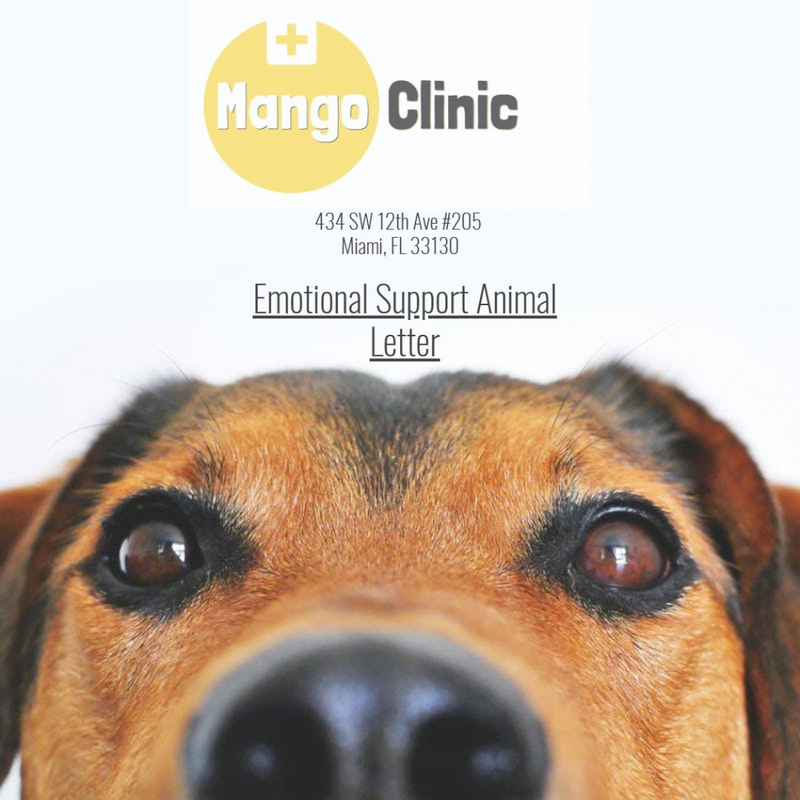 Get your Emotional Support Animal letter online or in-person at 434 SW 12th Ave #206 Miami Florida 33130. Free Parking in rear. Call us to schedule your ESA letter appointment now. Nice work. I was looking for some tips to fly with my esa. Actually i got myself an esa letter a fortnite back from this website myesadoctor. And am planning to fly next month with my terrier. Glad that i found your article. It was a real help. Keep up the good work. MyESADoctor is Scam. They do not provide patients with legitimate ESA letters.